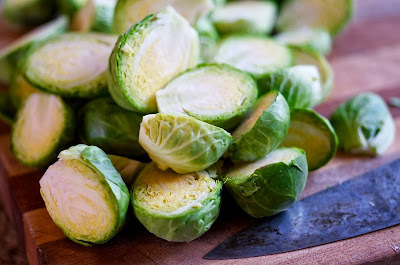 I am a big fan of brussels sprouts, but I am amazed how many people don't like them. I can only imagine this is because of too many mushy overcooked experiences as a child. However, I find that even the doubters will turn around after smelling these cooking away in the oven. The key to getting these perfect is not to overcook them and to get just a little bit of char on the sprouts. I think these are wonderful as a side dish, but I particularly like them served over pasta with a squeeze of lemon. 4-5 cups of Brussels Sprouts, hard end cut off and then cut in half. 1 large Shallot, peeled and sliced thinly. 4 Cloves of Garlic, peeled and sliced thinly. Begin by preheating your oven to 400 degrees and preparing your sprouts. Put the sprouts into a Pyrex oven proof dish, which is large enough that they can lie in one layer. Add olive oil, shallots. garlic and toss, and then add salt and black pepper. Put into the oven and bake for at least 30 minutes, stirring once halfway through cooking. Serve as a side dish or over pasta. If you choose to serve them over pasta, then I think they are great with a squeeze of lemon, sprinkle of chili flakes and a bit of Parmesan cheese. Enjoy!